Highly potent, competitive NMDA antagonist; more active enantiomer of (RS)-CPP (ab120160). (Ki values are 0.04 (NR1/NR2A), 0.3 (NR1/NR2B), 0.6 (NR1/NR2C) and 2.0 μM (NR1/NR2D)). Also available in simple stock solutions (ab144495) - add 1 ml of water to get an exact, ready-to-use concentration. Functional Studies - (R)-CPP, NMDA antagonist (ab120159)Herman et al PLoS One. 2011;6(11):e26501. doi: 10.1371/journal.pone.0026501. Epub 2011 Nov 1. Fig 3. Transporter blockade does not reveal an ambient glutamate concentration gradient between extracellular compartments. A. Average Ca2+ increase in a spine during a 40 ms voltage step, with iontophoresis of L-aspartate (black), without iontophoresis (red), a second L-aspartate application (gray), L-aspartate in the presence of 100 µM TBOA (blue), and TBOA alone (green). B. Comparison of spine Ca2+ transients in each condition, normalized to the first response to L-aspartate iontophoresis (n = 5). Error bars indicate SEM. Significance determined by Friedman ANOVA with Conover posthoc test: *p<0.05; **p<0.01; ***p<0.001. If the extrasynaptic glutamate concentration is higher than that in the cleft because transporters prevent diffusion of glutamate into the synapse, blocking transporters should result in a large Ca2+ increase in the spine as extrasynaptic glutamate rushes into the cleft and activates synaptic NMDARs. Spines exhibited a Ca2+ increase during a 40 ms depolarization with iontophoresis of the glutamate transporter substrate and NMDAR agonist, L-aspartate (A; black and gray traces), confirming the presence of NMDARs. However, TBOA (100 µM) did not increase the Ca2+ transient in the same spines during the 40 ms depolarization when compared to the control voltage step without L-aspartate iontophoresis (See image compare green and red traces; 20.6±13.62%; p>0.5; n = 5;). 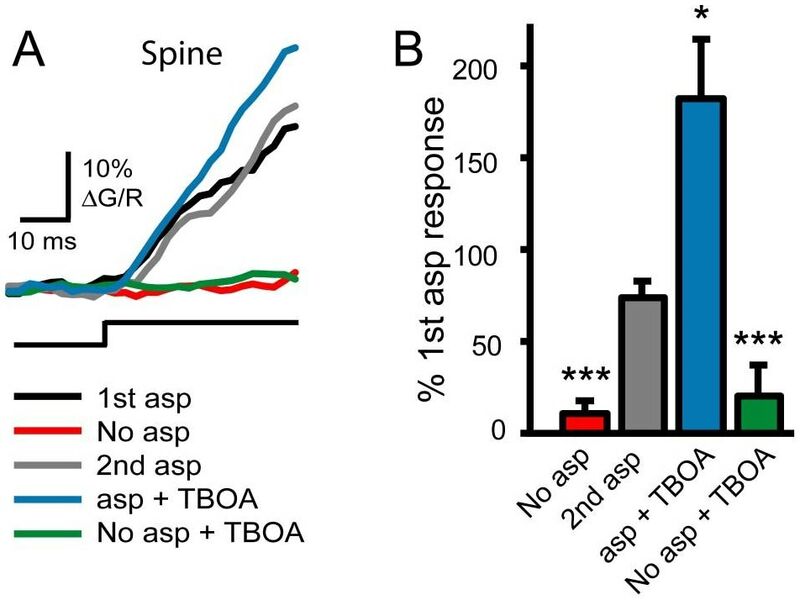 TBOA was effective in blocking transporters, however, as the NMDAR-mediated Ca2+ signal evoked by iontophoresis of L-aspartate was increased in the presence of TBOA (See image). This result indicates that glutamate transporters do not normally generate a concentration gradient of ambient glutamate between extrasynaptic and synaptic extracellular compartments. Publishing research using ab120159? Please let us know so that we can cite the reference in this datasheet. There are currently no Customer reviews or Questions for ab120159.